To say that I'm so excited for today's post is an understatement. Within the last week and in part thanks to the Nordstrom Anniversary sale (don't forget about our Nordstrom Sale Guide that we update every day! ), I've been starting to dip my toes into the transition between summer and fall fashion (despite the fact that it was still 105 sweltering degrees here yesterday. Clearly I need some fall in my life). That means that I'm not only figuring out how to transition summer pieces that are already in my wardrobe into fall, but I've also made a rule for myself for the rest of my summer shopping: any piece that I add to my wardrobe must also have a place in the fall lineup. Enter, today's transitional outfit! The most important transitional items in my wardrobe are always my shoes. I can't go crazy and buy 5 more pairs of thong sandals in August. Nope. Inappropriate, Mar. Inappropriate! So when this month rolls around, I have to start thinking about the long game, and that means that at this point in the summer I'm adding shoes that make sense for summer, but can also do fall like a pro. I give you, the silver huarache mule that I'm wearing here from a brand that crafts some of the most gorgeous footwear creations, Latigo! I absolutely adore huaraches. And if you're not familiar with that name or that style, you probably know more than you think! Huaraches are a type of woven leather sandal that originated in Mexico and became popular in the '60s here in North America. Which means that you've probably seen someone sporting huaraches at some point in your life or heard them referenced in a bevy of songs, books or movies. And I, along with my ever fashion forward mom, love huaraches. They're so versatile and seriously comfortable. The huarache has definitely taken on a life of its own as of late, coming back into popularity in a variety of inspired takes on the style. A comfy-cool huarache mule that I can slip on and off at a moment's notice? Yes yes yes. I also think that everyone needs one if not several pairs of metallic shoes, so the silver really sealed the deal for me with these beauties. Silver and gold are neutrals, people. They go with everything. Get on board! I was actually introduced to Latigo (you may have seen them at Anthro, Free People, Macy's, Mod Cloth, etc. etc.) while we were on the Bequia leg of our honeymoon and we had the pleasure of meeting the insanely talented and oh-so-adorable designer behind Latigo's coveted creations, Naomi. And trust me when I tell you guys that Naomi is as perfect and beautiful and sweet and chic as Latigo's designs, and I've been falling in love with the brand ever since we met. Everything in their range is just as Naomi is - comfortable, casual and feminine without being too fragile. Every expertly crafted, unexpected detail is perfectly placed, they ooze effortless bohemian style and instantly pull an outfit together while making it all appear completely fuss-free. I'm also pretty smitten with these spotted sneakers, this scalloped bootie that's perfect for fall, this colorful peep toe and these versatile leather mules. I told you they were really, really good. And speaking of effortless cool, there's also something about the thought of fall this year that has me wanting to pair everything with a boyfriend jean, especially a more tailored, feminine top like this one to give the look a little bit of contrast. Maybe it's the cozy, relaxed vibe of the season or just the fact that a good boyfriend jean is so darn comfortable. Whatever it is, I'm all in and when I found the pair I'm wearing here at the Nordstrom sale (designer denim is my favorite thing to pick up at the sale) I was a goner. They're so insanely soft and comfortable, the fit is perfectly loose without being "baggy" and they're nice and straight through the legs. You'll definitely be seeing these babies on the blog for as long as you can possibly stand it, so buckle up because we're in this for the long haul! And they pair perfectly with my huarache slip-ons, so there's going to be a lot of repeating that combo in the next few months. 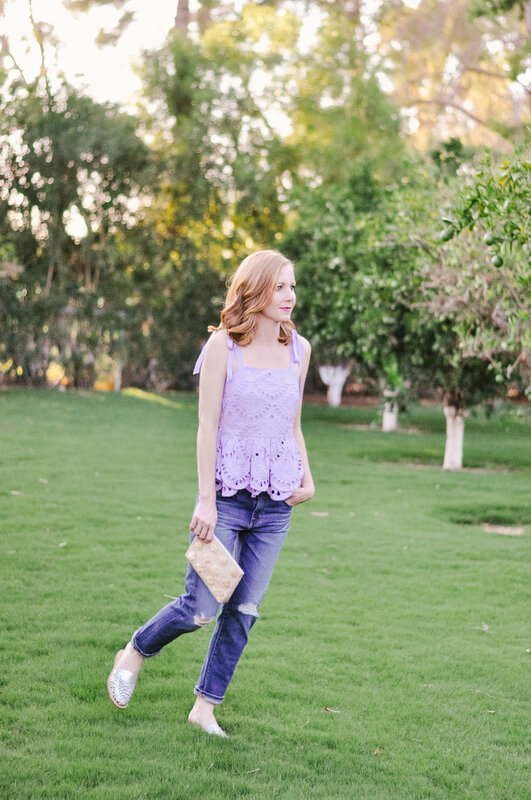 And I knew that this pretty little lavender J.Crew tie shoulder top with my very favorite kind of detail, eyelet, had to be mine the moment I saw it hit J.Crew's site. I realize that it may seem like a pretty summery item to be trying to transition into fall, but there are so many layering pieces that I can throw over this top when the temps drop, and the ties at the shoulder are flat enough that even a light cardigan would work! 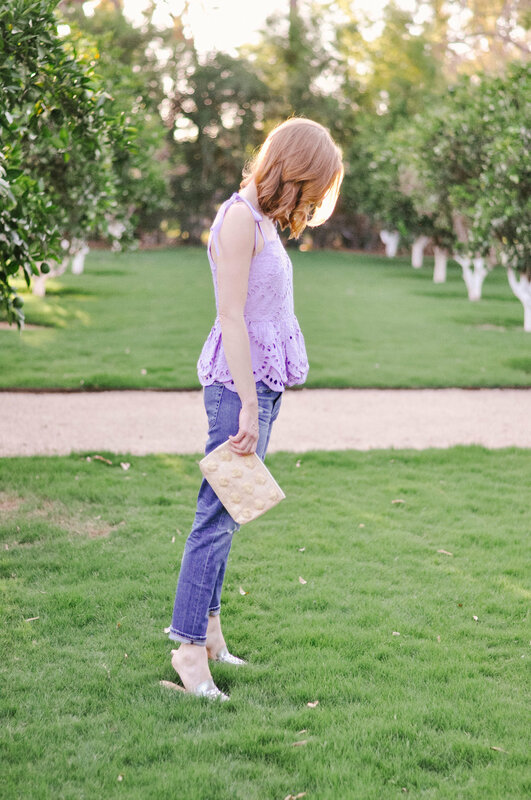 I especially love pairing lavender with green or grey (hence our green Arcadia citrus grove backdrop in today's pics) and would definitely pair this with a soft, grey or emerald cashmere cardigan. I also just picked up this rich brown suede moto jacket at the Nordstrom sale that I'll definitely be wearing over this top the first chance I get this fall! So I have to know, are you guys ready for fall, or are you still savoring every drop of summer that you can get? And if your brain is already thinking about cooler temps, cozy outfits and pumpkin spice, what are your favorite pairs of transitional shoes - booties, flats, something else? Drop us a comment in the comments section below! This post was created in partnership with Latigo Shoes, who provided products we love. All opinions are our own.